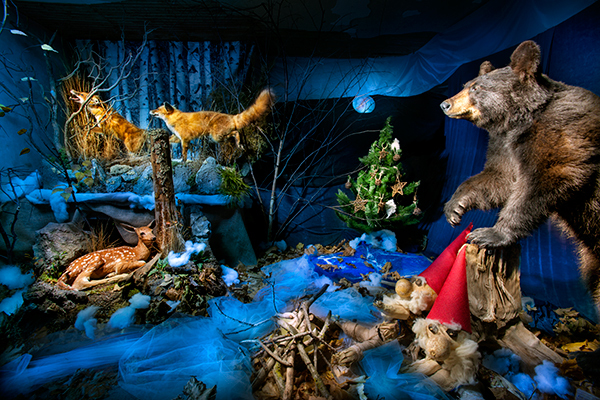 This is a Christmas display in the old spring house at Poole Forge.I was asked to shoot it as part of the record for the event.It was very tricky to light considering it is in a tiny little room in pitch black darkness and I could not move around the room.Everything was lit by shining light through a small window or by using an extension pole with a flash on it. 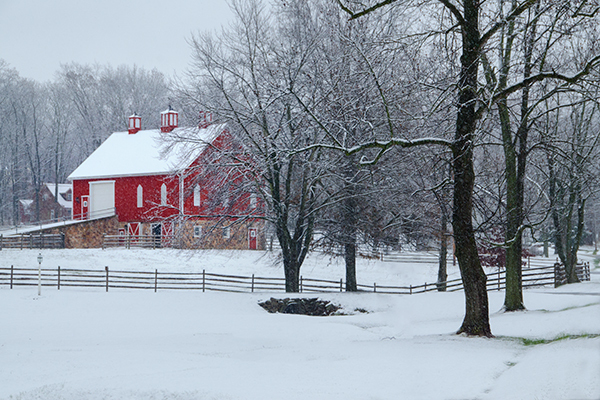 I captured this winter image a few weeks ago in the only snow storm we have had this year so far. The weather men predicted a colder and snowier season but so far this has been a major let down. I am tired of rain and hope we get about a foot or two of snow at once so I can get out and enjoy the scenery again. 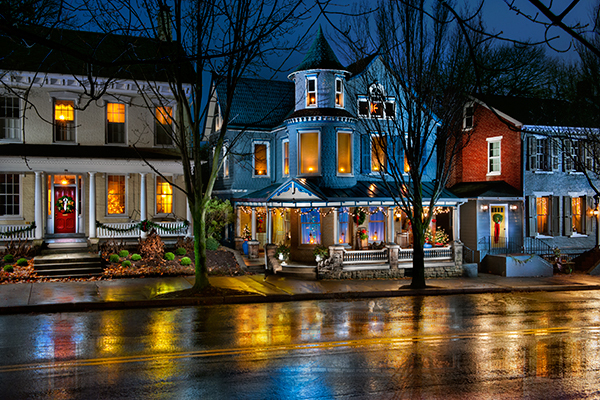 This set of images features the home in the middle on the top photo,and caught my eye on another rainy night in Lititz ,PA. The shimmering streets had me looking for a great reflection and I had admired this home for years,so decided to give it a whirl. First I found a business across the street that had an overhang to keep the camera dry and then the real work began. First the street was empty except one car and guess where it was parked,and if you said right in front of the home you would be right.Well I hoped for the best that the car would miraculously leave and began shooting my exposures,and about 5 minutes into the shoot a second car pulls in behind the first. I knew I had the portion of the photo captured with that second car missing so I only needed the first car to leave and thankfully the owners came home and as they were talking to me, I commented on the car and they said it is ours and we will gladly move it. I spoke to the neighbors on both sides and asked if a few strobe pops would be okay and they said sure,so I included a bit of their homes as well.The Moravian star in the attic window was the finishing touch. It was night-time when I shot this,so I had to use a long exposure to get some sky to show up and I covered the lower part of the lens with my wallet during the exposure to keep flare from the lights to a minimum and once again doing even 15 second exposures proved frustrating because this is along a major highway through town and traffic is relentless,so I am rather proud to have accomplished a car less shot. 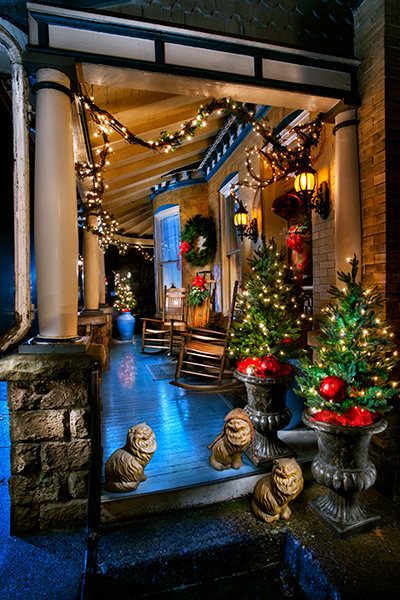 The lower image is a closer view of their beautifully decorated porch and the three cats were moved to their perch at the edge of the porch because I could not see them from my vantage point and the one with the hat just cracked me up. The windows on the curved wall are actually original and curved as well,and thanks to a light mist,the porch had a wet layer that reflected the urn at the end. 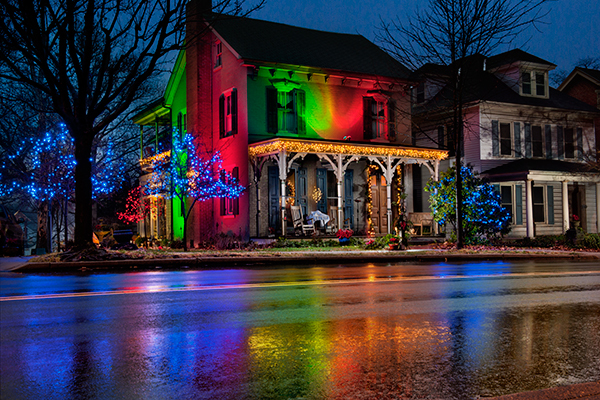 A wet road reflects the vivid colors of these Christmas lights.The blues are hard to look at for some reason and its a weird wavelength of light to capture. 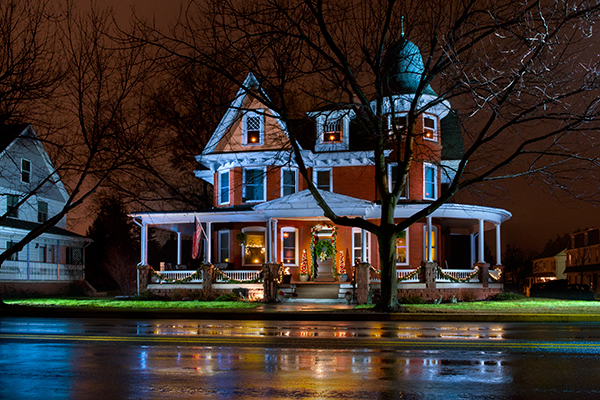 Todays image comes thanks to the trusting folks who own this home and their willingness to let me shoot it. 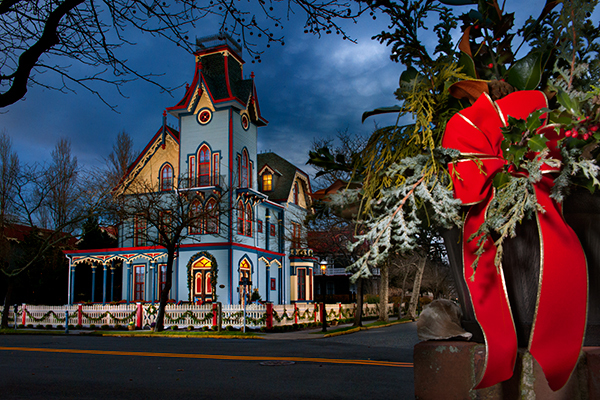 I went to this location because the homes exterior was included on a Christmas light trolley tour but when I got there it was loaded with cars all over the place so I had to go to plan b. I went to school eons ago with the owner and he invited me in to chat a bit,and while inside he showed me this parlor room. My creative juices immediately started flowing and I said I would love to shoot this sometime and oh by the way,how about right now? He said they were going out for supper but maybe in an hour I could try,but I mentioned I needed the window light to show before nightfall and he said well you can stay and we will leave. So while they were out,I captured this image. A few interesting tidbits include the painting in the right corner of Santa Claus is something the owners mother painted and I added that to the shot on the easel,and when I started this shot,there was a music box on the table but it was hard to tell what is was so when the owner returned, I mentioned that I wished there was something more interesting on the table and he said he had this neat old german clock and a photo of his parents as well that might work.Those two items look much better than the original box,and normally I would not try to change anything mid-shoot,but this worked perfectly. 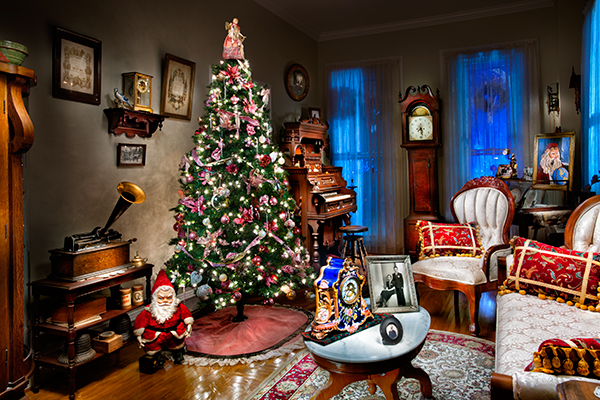 The place takes you back in time to an era of great pride in workmanship and just looking around the room you see neat things like the music box,the old pump organ,grandfather clock and so on. Thanks to the trust and willingness to let me have some fun,I got this neat photo taken from the pages of the past.